This blue flower brooch includes a diamond center and six petals made from groups of sapphires, each tipped with diamonds depicting the curl of the petal edge. It came from the collection of the late Queen Elizabeth the Queen Mother and is identified by Leslie Field in The Queen’s Jewels as an anniversary present from her husband, King George VI. The King does seem to have been a fan of sapphires, having chosen them for several gifts over the years. 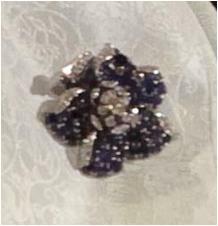 Following the death of the Queen Mother in 2002, this brooch (along with the rest of her collection) passed to her daughter, the Queen. It hasn’t been a favorite for the Queen so far, but its use of dimension and quantity of sapphires make it a notable addition to the collection.